In last season’s Unity 250 PASS Pro Stock race (then known as the DNK 250), three of the best PASS drivers out there diced it up towards the end of the race. 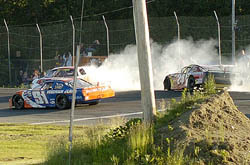 Ben Rowe got together with his father Mike Rowe within the final few laps and Johnny Clark watched from a safe distance back. Clark passed both Rowes and went on to win. Clark sliding backwards into the turn three dirt banking as the laps clicked down. But in the end, none of those storylines came close to preparing for what would happen in the final five laps. Johnny Clark was leading on a late restart after spending plenty of time out front all race long. Mike Rowe had battled back from carburetor problems and was hot on his tail. Rowe looked faster, but Clark had the position. Everyone could see what was about to unfold. There was a little bumping and banging before the two drivers made it to turn two. That’s where it all came to a head. Ben Rowe might have had the best seat in the house for the whole incident. Leperle gleefully watched that something exciting happen as well. “I was hoping for something like that,” said Leperle. And what went through Leperle’s mind as it all unfolded? Leperle could hardly contain himself after climbing out in victory lane. He and his whole team were very emotional. 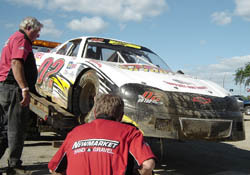 With his victory, Leperle now becomes only the second driver, joining Dale Shaw, with wins in PASS and in the modern (post 1992) era of ACT Late Model racing. When Leperle was told this fact after the race, he was equal parts surprised and humbled. Meanwhile, Canadian Patrick Leperle ventured to Unity for the first time and quietly stayed out of trouble to finish 13th. You can bet he was taking notes though. So in this year’s race, when Clark and Mike Rowe got together exiting turn two with only two laps to go, Leperle was ready to pounce. 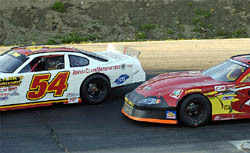 He inherited the lead, drag raced Ben Rowe side-by-side over the final two laps and won his first PASS event. 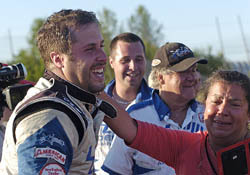 But before he could win his first Pro Stock race, Leperle had to hold off a side-by-side restart with two-time PASS champion Ben Rowe on his outside. Leperle didn’t miss a shift, but Rowe hung right with him on the green flag and they raced hard and clean to the finish. Sure enough Patrick, it’s up there now. 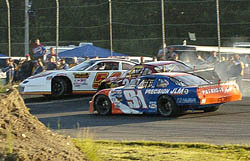 Speed51.com will have plenty more from Unity this week in our PASS Leftovers column.